Just to let you all know, if you are using WordPress you can upgrade today. The latest stable release of WordPress (Version 2.0.4) is available. his release contains several important security fixes, so it’s highly recommended for all users. We’ve also rolled in a number of bug fixes (over 50! ), so it’s a pretty solid release across the board. Also fixes for the serious SQL vulnerabilities that led to several WordPress sites being hacked. Upgrading is fairly simple, just overwrite your old files with the latest from the download. If you’d like more thorough instructions, the Codex is always the best spot. Since this is a security release, if you have any friends with blogs make sure to remind them to upgrade and lend a hand if they’re not too savvy. We’re all in this together. As we reported here at Darknet, there was some serious security issues in 2.0.3 and below so it’s recommended you upgrade immediately. 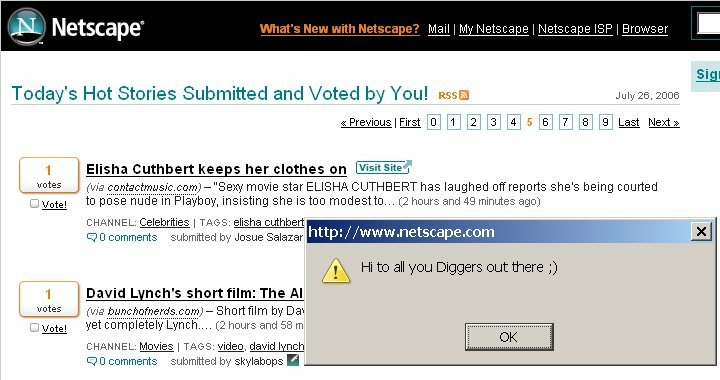 Netscape.com has been hacked via a persistent Cross Site Scripting (XSS) vulnerability in their newly launched Digg-like news service. 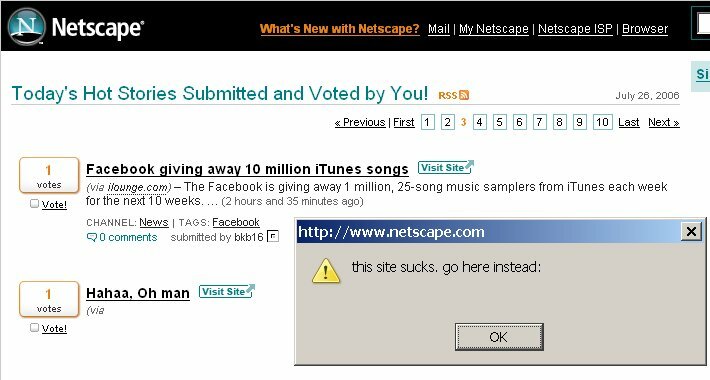 It seems the attacker did report the flaw to them repeatedly but they didn’t heed and ignored it, so he performed the XSS all over the site. It was me. I did it. C’est moi, etc. This was in response to my having reported the month and a half old vulnerability to Netscape over a week ago. They ignored me. I reported it again, multiple times; they continued to ignore. I posted a few stories on their site, which made it to the front page and were deleted. I made the decision, in response to the recent Rose/Calacanis debacle, to add a benign script to the site that everyone would see and recognize as a compromise of security because this vulnerability is serious and they were not taking it as such. They had this coming; this isn’t a juvenile prank, and is only marginally retaliation against Calacanis for being a twit. This is making sure their users don’t get hacked too. Luckily nothing malicious has been done and the users aren’t at risk, as far as we know anyhow..
We are happy to announce that Hping 2 works with Windows XP again! Hping support on Windows was never that great. Darknet is indeed a great fan of Hping! Glad to see it has overcome the Raw sockets problems Windows XP SP2 brought about. I’m guessing they used the Ethernet frames workaround that was implemented in nmap. For those who might not know, hping 2 is a packet crafting tool created by Salvatore Sanfilippo and ported to Windows by Rob Turpin. The unix version is available at http://www.hping.org. When Microsoft removed raw socket support in SP2, hping and a number of other programs broke. This causes problems in situations where Windows is the only thing available. Thankfully the developers decided to fix the problem. For this, we would like to thank Fyodor and the Nmap developers because they had already overcome the biggest hurdles and we were able to work with their code and make it work within Hping 2.